Michele Bilyeu Creates *With Heart and Hands*: Frosty, White, Dark, Tree, Sassafras, Beaver Moon! Frosty, White, Dark, Tree, Sassafras, Beaver Moon! I love full moons. And I have always really loved their traditional as well as ancient names and descriptions. So, when the sky is clear enough to see one, I like knowing which month, and which moon I am checking out and dancing in the light, there of! My old tradition (if you ever read here during my astronomy/astrology posts) is to grab a great big bag, run outside in the dark, and entrance any neighbor who might possibly be able to view my fairly secluded back yard, with my 63 and 3/4 years old presence and I run around in my red and white polka dot pajamas, dancing and chanting...'filler up, filler up'...the old superstition for creating abundance in your life for the next month! Filler up refers to the bag, purse, pouch..what ever you've grabbed as you catch the moon beams magic! And yes, it is such amazing fun to do this, at any age! There is a wonderful energizing feeling to the air, not to mention being outside in one's pajamas by moonlight, that is such fun! This full moon is called "Beaver” Moon, linking back to the activity of these busy little animals as they are working so hard to gather food and fix their dens for the upcoming winter. But the moon is also sometimes referred to as the “frosty” moon, given the time of year. 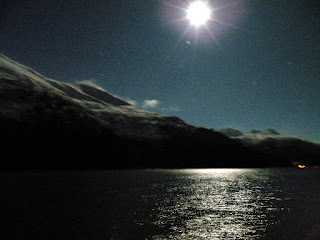 The full moon, above, from one of my trips to Alaska where my sister-in-law and I donned heavy parkas..well, I wore three on top of one another..and literally danced on my wonderful Sandy Beach on my beloved Douglas Island. 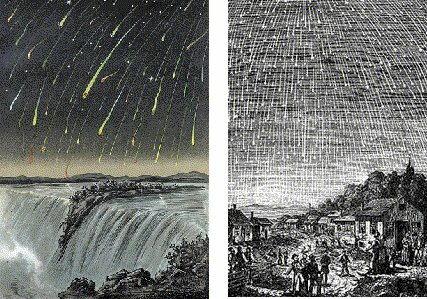 And this wonderful sassafras moon is also marked by the fall appearance of the Leonid Meteor Showers which peaks between Saturday evening and Monday morning. Unfortunately, the nearly full moon will make viewing the shower difficult. EarthSky says to expect about 10 to 15 shooting stars per hour, but the actual number you can spot, given the moon’s brightness, may well be lower. And to top that all off, we are also witnessing the sudden brightening of the Comet Ison as of November 14th..if cloud cover in your area permits, look up at the wonders you might see! With the anniversary of JFK's assassination, the horrors of the typhoon in the Philipines, the downing of airplanes in the UK and the loss of life is so many places from so many disasters, it is no wonder that ancient peoples looked up at the night sky and imagined the portents as being so dark and negative as so many forces occurred at once. Keep up the positive thoughts for a healing from so many events past and present and better times to come for all! Busy beavers (our Oregon state animal) we are gathering up geraniums to weather over in our little green house space, raking immense piles of leaves, and putting away gardening tools for the winter. One last lawn mowing and then away into storage for our lawn tractor. With 2 1/2 acres, we have a lot to mow and a lot to pick up and care for. Frosty, white, dark, trading, broken horn, tree, sassafras, and beaver moon lights our path was we look up at the night sky for omen of meteor showers and comets! Woodcut showing destructive influence of a fourth century comet from Stanilaus Lubienietski's Theatrum Cometicum (Amsterdam, 1668). Michele-I love your magical articles and posts. I only wish I had those pajamas and your bravery. What a interesting article. I enjoyed this and you made me laugh and I needed to do that today! I wish I could run with such abandon to collect moonbeams too! With 2 dogs to leave land mines I fear more to slip on their leavings and break the spell ~lol~ Hope you brought plenty plus to make it through the next month. Funny how every culture has a different name and thoughts about the night sky. great post Michele! I will have to find time to run out and collect some moonbeams.! It does sound great fun. :) What a cheerful image of you in your polka dot pajamas dancing and chanting in the moonlight! Love it! Oh how dreamy and misty and spacey and interesting Michele!!! Oh yeah....lets dance outside with giant bags and catch it all!!! What fun :) Count me in.